Abstracts are submitted electronically by completing a form available at the LINK. The number of papers per author is limited to (2) papers. The deadline for submission of abstracts is March 15, 2018. Authors will receive notice whether their abstract has been accepted by April 1, 2018. The accepted abstracts will be published in the Book of Abstracts, which will be given to each participant upon registration. The deadline for submission of completed papers is May 1, 2018. Papers will be preliminary published on the conference website and made available to all registered conference participants. Subsequent to the peer review and conference presentation, the papers will be published in the electronic Conference Proceedings. A prerequisite for a paper to be published in the Conference Proceedings is to present it either as an oral presentation or as a poster presentation. Paper should be sent to e-mail: dku@dku.hr. Guidelines for authors who would like to publish their papers in the Conference Proceedings are available here. 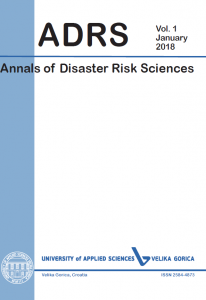 Guidelines for authors who will be able to publish paper in the scientific journal ADRS-Annals of Disaster Risk Management are available here.